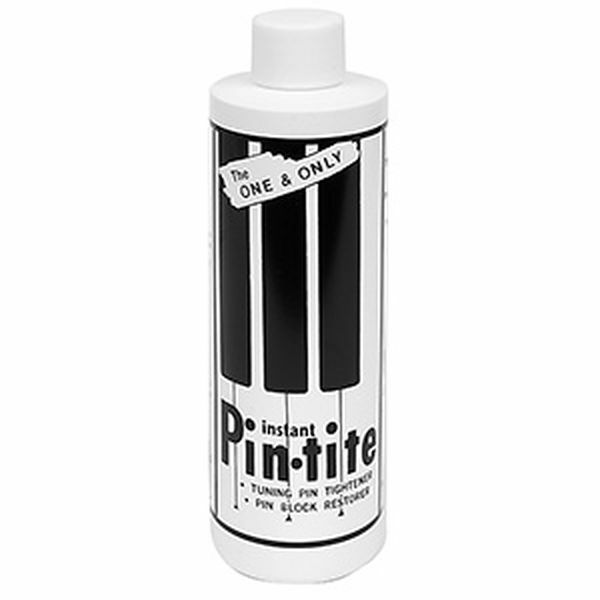 LUNSFORD'S INSTANT PIN-TITE - Tightens in minutes. Successfully treat loose tuning pins resulting from dried out pin blocks. Preserves and protects wood, remains dry, tune within 1-1/2 hrs. Also tightens instantly many action parts, cases, benches and stripped screw holes. Apply around the base of each tuning pin. Prior to application, remove Grand Actions from piano... Uprights should be placed on their backs. This was the first time that I have tried this product. The piano was a beautiful old 5.5 ft upright. The pins would not stay on pitch for about 10 strings in the high middle. Other strings ok.
We ended up using about 1 and 1/2 bottles, waiting each time until it soaked in. Then the last time, it would not. Waited an hour then it tuned fine. A little sticky. Had to wash my hands as tuned.